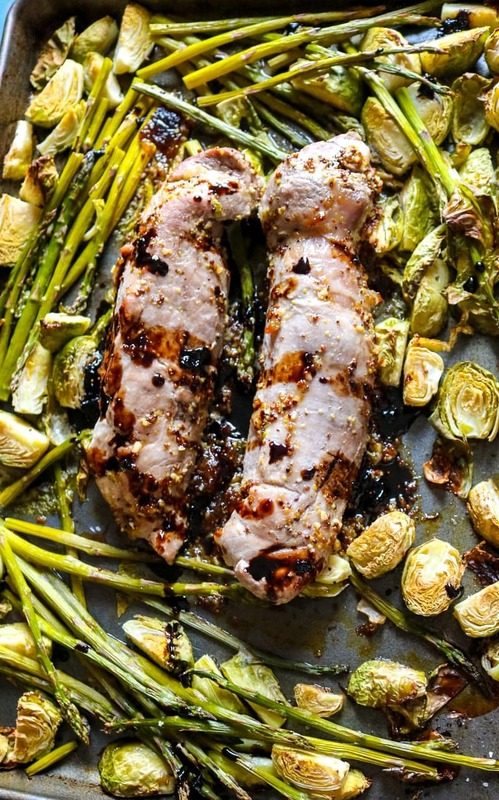 Sheet Pan Fig Glazed Pork Tenderloin with Roasted Vegetables: Simple one pan meal featuring tender pork tenderloin with roasted Brussel sprouts and asparagus with a Maple Fig glaze. Is there ANYTHING better than meal that can be prepped in minutes and only dirties up one pan? You are right, a million dollars and all you can eat chocolate IS better–but I can’t help you out on that one. 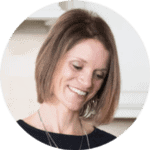 What I can help you with is getting a healthy, family-approved, delicious meal on the table with minimal effort. In fact it is my PASSION! 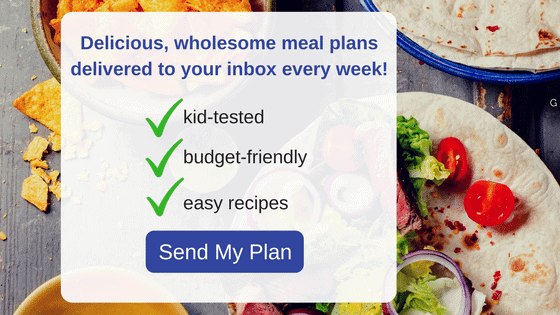 I have a post that is devoted to a month of 30 Minute Meals!! And I LOVE meals that can be prepped in one pan–like this easy pork tenderloin recipe. 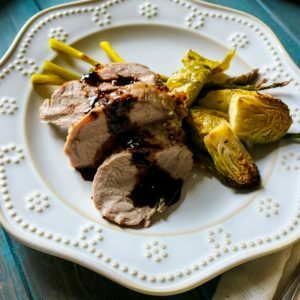 Tender pork tenderloin is flavored with a rich fig and mustard rub and roasted with Brussel sprouts and asparagus for the perfect cross between a sweet and savory meal. 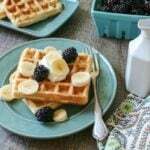 You can finish the dish with a reduction of balsamic vinegar and fig preserves and it will take this dish OVER the top, but of course you can save yourself a pan and serve straight from the oven. This pork tenderloin has incredible flavor without the glaze as well. 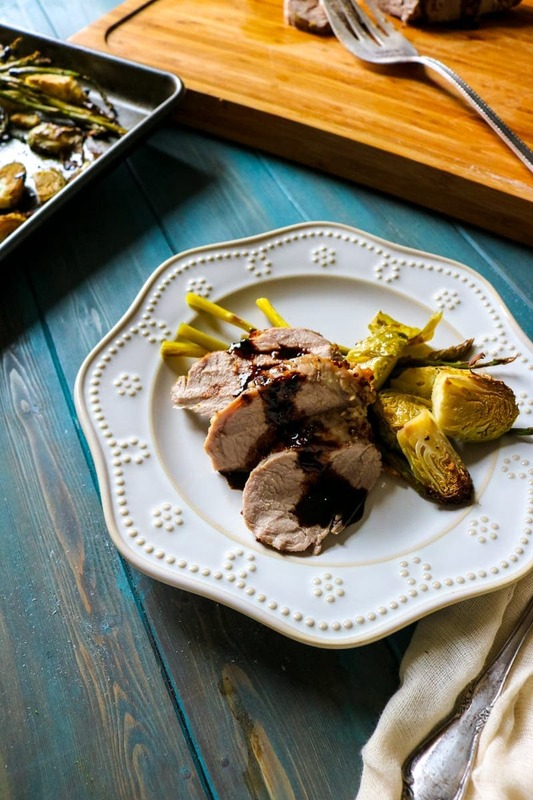 Pork Tenderloin is roasted with vegetables and a rich fig glaze all on one sheet pan. Toss brussels sprouts and asaparagus on sheet pan with olive oil, 1 teaspoon salt and 1/2 teaspoon pepper. Spread out evening, allowing room for pork tenderloin in middle of pan. Whisk together fig preserves, mustard, garlic and remaining salt and pepper. Place pork on sheet pan and rub with fig spread. Roast for 20-25 minutes, or until pork reaches 145 degrees. Allow pork to rest 10 minutes before slicing and serving. 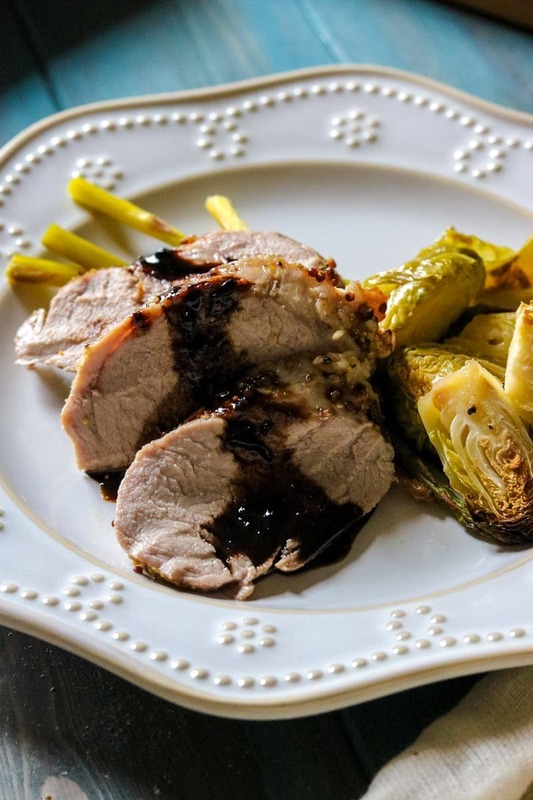 If making balsamic reduction, while pork is resting, bring balsamic vinegar to a boil over high heat, reduce to low heat, whisking every little bit until thick and syrupy--this only takes about 5-7 minutes total. Watch carefully so not to burn! Drizzle pork and vegetables with glaze and serve.